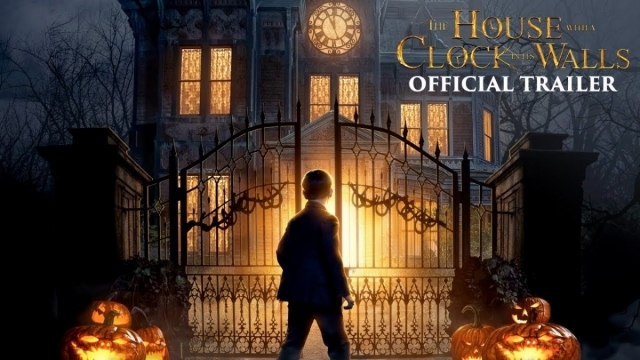 When author John Bellairs first delivered the elevator pitch for his 1973 novel, The House With a Clock in its Walls, the genre mash-up was hailed as something of a gothic horror story designed specifically with child readers in mind. And nowhere is this family-friendly plot more apparent than in the spooky first trailer for Universal’s big-screen adaptation, which comes to us by way of Eli Roth (Cabin Fever, Hostel) and Steven Spielberg’s Amblin Entertainment – therein lies the intersection between shock horror and light-heartened fun for the whole family. In saying that, you’d be forgiven for thinking that The House With a Clock in its Walls was actually Guillermo del Toro’s follow-up to his Oscar-winning efforts on The Shape of Water. Starring Jack Black (Goosebumps) and Cate Blanchett (Thor: Ragnarok), Eli Roth’s delightful adaptation tells the story of a young, recently-orphaned boy, played by Owen Vaccaro, who moves to his uncle’s house only to unleash some long-dormant black magic upon the hapless townsfolk. You see, buried within these walls is an ancient, unspeakable evil. Years ago, the house’s previous owners dabbled in the supernatural as they plotted to bring about the end of the world through an eternal, enchanting clock hidden in the walls – hence the title. Also starring Kyle MacLachlan, Colleen Camp, Renée Elise Goldsberry, Vanessa Anne Williams, and Sunny Suljic, today’s first-look teaser has truly dropped out of nowhere, and thanks to its big-name supporting players (Black! Blanchett! ), not to mention the involvement of a gore-free Eli Roth, it already feels like Universal’s gothic horror boasts serious cachet. “Do you hear the ticking?” The House With a Clock in its Walls swings its doors open to the public on September 21st.